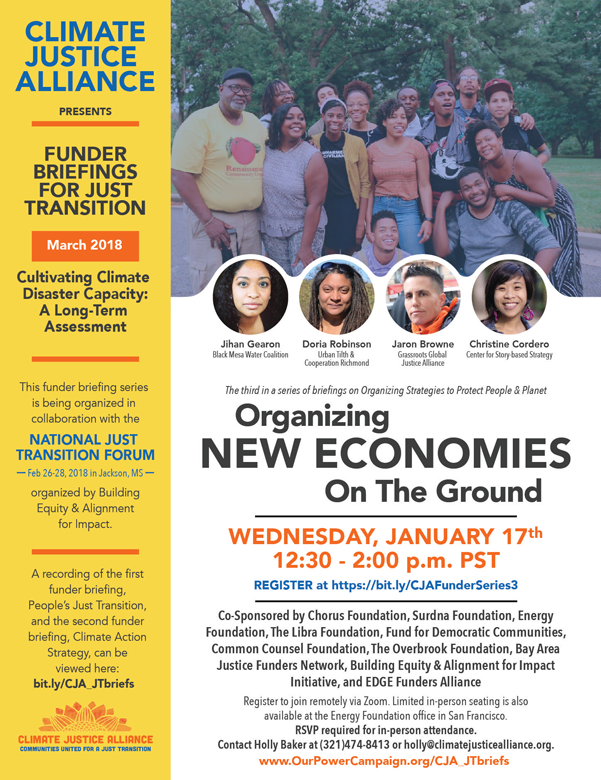 Join us for the Funder Briefings for Just Transition, a four-part series organized by Climate Justice Alliance, to learn how Just Transition principles, strategies, and practices of frontline communities provide systemic solutions for the planet. The third funder briefing is sponsored by Chorus Foundation, Surdna Foundation, Energy Foundation, The Libra Foundation, Fund for Democratic Communities, Common Counsel Foundation, The Overbrook Foundation, Bay Area Justice Funders Network, Building Equity & Alignment for Impact Initiative, and EDGE Funders Alliance. Register here to join remotely via Zoom. In-person seating is also available at the Energy Foundation office in San Francisco. Communities of color and working-class people are the first and most impacted by climate disasters — droughts, storms, and wildfires — as well as the poverty and pollution burdens of the dig, burn, dump economy causing these events. Organizers in these communities, with lived knowledge of these impacts, are applying their power, wisdom, and vision to tackle the climate crisis with Just Transition strategies to build resilient, regenerative, and equitable economies to meet the needs of our common future. This funder briefing series is being organized in collaboration with the National Just Transition Forum, organized by Building Equity & Alignment for Impact.